Before making the choice on whether to purchase a round/oval tent or square/rectangle tent there are several things to consider. You want to choose the tent style that is the best for your need. If you haven’t purchased a tent before, it can be a tough decision. The round & oval tents and square & rectangle tents each have their own unique style and advantages. In this article I will show the advantages of both tents. a. A round end tent will disperse the wind much easier than a square end simply because of its shape. It will do this whether it is a small or large tent. A square end will tend to catch more wind on its flat sides. b. When the wind and weather hit a round end tent, every tie down will share the load equally. On a square end the corners are left to do most of the work. Especially on a big tent. #2 Because each tie down shares the load equally, this style of tent will allow you to stretch it out more easily and get rid of wrinkles in the top. This could definitely speed up your set up time. #3 The shape of these tents are attractive and unique. Anything you can do to draw people to your commercial tent event is critical so the round & oval shape can be a real advantage. #1 A square end tent might simply fit the lay of land you have better than a round end tent. Many of our customers have limited space which makes it an easy choice to go with a square or rectangle tent. #2 If you are using square or rectangle shaped tables you will be able to make better use of the available space under this style tent than you would with a round end tent. #3 A square or rectangle tent has consistently been the most popular choice by commercial event tent companies around the world. In recent years, our customers are experimenting more with different shapes, but the square end seems to be the favorite choice for any event whether it is used as a wedding tent, a small party tent for a family gathering or simply a large party tent when your home or business doesn’t provide enough room. Although I have stated that there is a wind resistant advantage of a round or oval tent, it is important to know the following: We have manufactured many small and large square end tents over the years and have shipped them all over the world. Many locations have extreme weather and many of these tents are left up semi-permanently or permanently. To ensure this style tent is wind resistant enough, you simply need to add additional staking positions to all the key strength points. Particularly the corners, middle of the ends of tent and on lace lines if tent has them. In very extreme situations our customers will secure the poles to the ground as well. What is great about all of our pole tents, no matter the shape, is they all have the same strength of construction. 2″ seat belt on every seam top to bottom, triple stitching with #207 thread, and all hot dipped galvanized steel to steel connections. We put as many as 6 belts thick on key strength points to insure that your tent will not give up or come apart. Regardless of which tent you choose, we are confident you will love the high quality of our round tents, oval tents, square tents & rectangle tents. 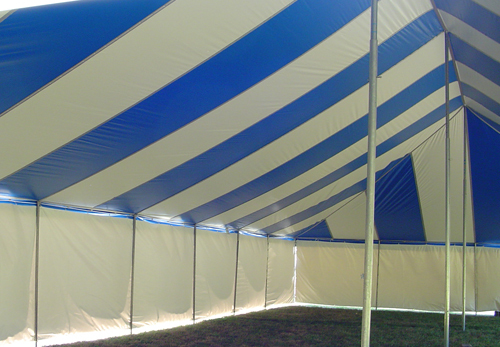 Our tents are designed to be the strongest, most reliable and longest lived pole tents in America.